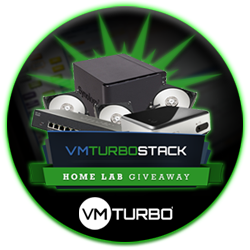 I could certainly do with that in my home lab and if you aren’t a customer of VMTurbo and you want a free 30-day trial then sign up here. Categories: Virtualisation, VMware | Tags: Home Lab, Operations, Virtualisation, virtualization, VMTurbo, VMware | Permalink. Today at VMworld EU there are going to be a number of announcements and as has become the norm for VMworld Europe, VMware are making a number of announcements around their new management solutions. One of these announcements is vRealize Operations 6.0. VMware vRealize is changing the name of the management solutions into simpler packaging and suites and as announced at VMworld US, vRealize Air Operations,Automation and Business will be available soon to provide a new SaaS solution for VMware customers via the renamed vCloud Air offering. There are a number of new features and enhancements in vRealize Operations 6.0 one of these is the new scale-out architecture allowing high resiliency and availability as well as self monitoring to ensure that if an instance/slice is lost, it is reported and brought back seamlessly. 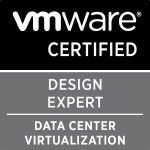 vRealize Operations 6.0 is now providing a public set of RESTful API’s to allow customers and partners to extend as well as get information in and out with ease so that it can be used for custom reporting or in the case of a project i have been on recently will allow monitoring of vCAC DEM’s and automatic provisioning of more if required. The management dashboard of vRealize Operations 6.0 has maintained the same three panels on health Risk and Efficiency to provide viewing and reporting of immediate and future problems as well as opportunities to optimise. With vRealize Operations 6.0 you now have a new section below each of the three panels there are now problem alerts which give you correlation of problems and the ability to click the alerts to see the details as shown below. There is also the ability to dig deeper into the problems by using vRealize Log Insight which can send alerts into vRealize Operations 6.0 if certain problems arise and allow custom reporting and alerting for partners and bigger customers who are looking for custom reporting and deep analysis. Below is a summary of all the new features and solutions in vRealize Operations 6.0 allowing reporting of public and private architecture as well as simplistic single pane of glass management. One of the biggest abilities of vRealize Operations 6.0 that I really like and i think will make all the customers I see as a consultant very happy is the support for new SDDC and hybrid cloud platforms meaning you can now monitor and report on networking,storage, OpenStack and vCloud Air. This will truly allow you to manage and report on your whole SDDC environment. With vRealize Operations 6.o as shown above is the ability to monitor and report on SDN solution NSX. With vRealize Operations 6.0 there is a new management pack for NSX.In the image below, you can see the heat map showing the transport layer. The transport layer is effectively all of the transport nodes (NSX term for hypervisors). These boxes are the ESX hosts registered with NSX, grouped by a particular transport zone. Transport zone is a group of hypervisors that share the same transport behaviour. On the bottom, the widget shows the top talkers. If there is a lot of traffic, this widget can help us figure out which VMs are responsible for the most network traffic. 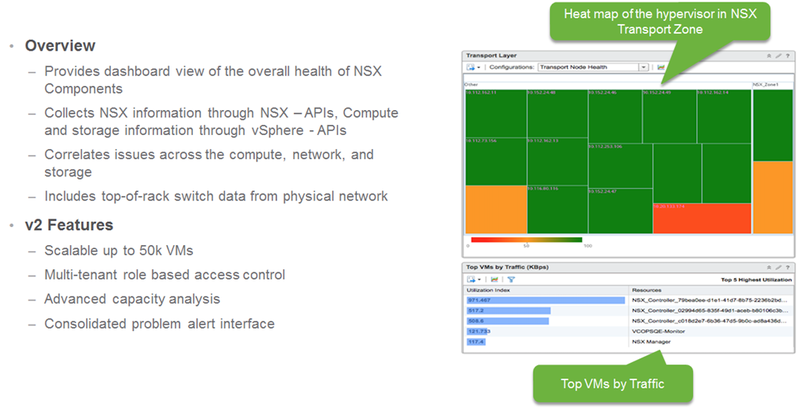 There are three NSX dashboards: NSX main dashboard, NSX logical topology and NSX Edge services. The current view is from the NSX main dashboard. Currently, we are a seeing information for a particular NSX Manager instance. The control plane widget is all the objects corresponding to the NSX Manager (API and connection to the vCenter Server for configuration), Controllers (responsible for configuring switches), Edge (VMs that deploy certain logical network services like DHCP, Load balancer etc. ), Logical Routers (Distributed routers responsible for configuring the routing software on each individual host). 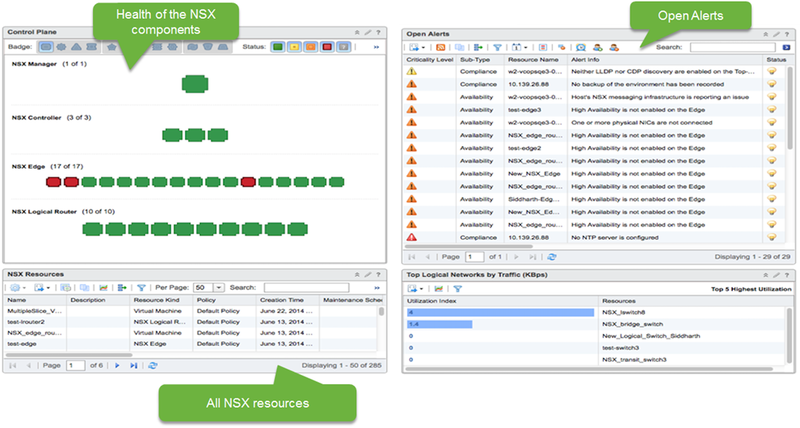 All the alerts related to NSX are captured in Open Alerts widgets. This is based on hard threshold violations. We can see a number of High Availability violations. We have 40-50 alerts that are configured out of the box. We have detailed documentation on each of these metrics and what the alerts mean. 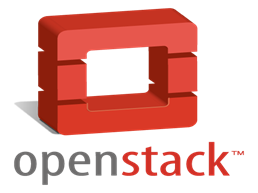 OpenStack is emerging as the leading cloud platform for enterprises and some SPs. VMware are going to provide a management pack to support OpenStack providers. It will mostly be sold to existing vSphere customers who have OpenStack deployments currently. vRealize Operations 6.0 is going to enable both SMB and Enterprise customers who have either or both on premise and off premise workloads in their private or public clouds to monitor, report and make more efficient their environments. I am looking forward to working with vRealize Operations 6.0 and seeing all the capabilities especially through the RESTful API availability to enable my customers both large and small to get all the reporting and management they require integrated into their existing solutions.Make sure you watch the live VMworld keynote to learn more. Categories: Automation, vCAC, vCloud, Virtualisation, VMware | Tags: automation, Management, NSX, openstack, Operations, SDDC, SDN, vCloud Air, Virtualisation, virtualization, VMworld, vRealize | Permalink.